While Cheonnyeon Daero’s stunning last-gasp win in the Korean Derby was the big story of the weekend, there was plenty of other action with Gippeumnuri the star as she landed the Japan Racing Association Trophy. On Sunday, the warm-up act for the Derby was the JRA Trophy. Traditionally a race which features the best of the up and coming imports at Seoul, it was won in impressive style by third favourite Gippeumnuri. The three-year old American bred filly led from gate to wire to take victory by three lengths. The weekend ended on a downbeat note, however. The build-up to the Derby had been all about the showdown between Money Car and Northern Ace – with a likely cameo from Seonbongbulpae. While Money Car was being turned over by Cheonnyeon Daero in the final few metres – possibly as a result of Seonbongbulpae’s pressure in the opening stages – Northern Ace was nowhere to be seen. Sensing something was wrong with his previously unbeaten mount, jockey Moon Se Young eased the colt in the home straight and, clearly distressed, immediately dismounted. The vet arrived and the diagnosis was not long coming; a fracture to his left foreleg and a potentially golden career cruelly curtailed. Cheonnyeon Daero snatched away Money Car’s chances of sweeping the Triple Crown in the very last strides of the Korean Derby at Seoul Race Park this afternoon. Entering the final furlong, Money Car looked to be cruising to an easy victory until out of the pack emerged Cheonnyeondaero, who reeled in the tiring KRA Cup Mile champion, overtaking him inches away from the line. As expected Seonbongbulpae burst out of the gate like a train, beating Money Car for the early lead. Money Car tried to match him stride for stride and maybe paid for it in the later stages. nevertheless, as they turned for home, Seonbongbulpae began to weaken and Park Tae Jong steered Money Car into the lead. Entering the home straight, they had a length on the field. By this stage it seemed a case of just how far they would win by and with a furlong to go, the gap was at least five lengths. Then came Cheonnyeon Daero. With two hundred metres to go it looked as though Money Car would be comfortable, by one hundred it was looking close, by fifty, punters were gasping in disbelief. The instant reaction was to question whether Park Tae Jong – the greatest Korean jockey of all time – had badly misjudged it. A look at the replay showed he had not. Money Car had simply run out of gas. Behind them Dangdae Bulpae took a surprise third ahead of Triple Sinhwa. The sour note of the race was an injury to second favourite Northern Ace. Showing towards the front in the back straight, he looked poised to make a run. Dropping back on the final turn though it was clear he had nothing in him and jockey Moon Se Young sensibly opted not to ease him. Devastatingly, following the race a vet’s inspection showed a fractured forelimb. So a Triple Crown winner is off the agenda for another year. Instead we have a clash of Classic winners to look forward to in October when this year’s best three-year olds reconvene for the Minister’s Cup. 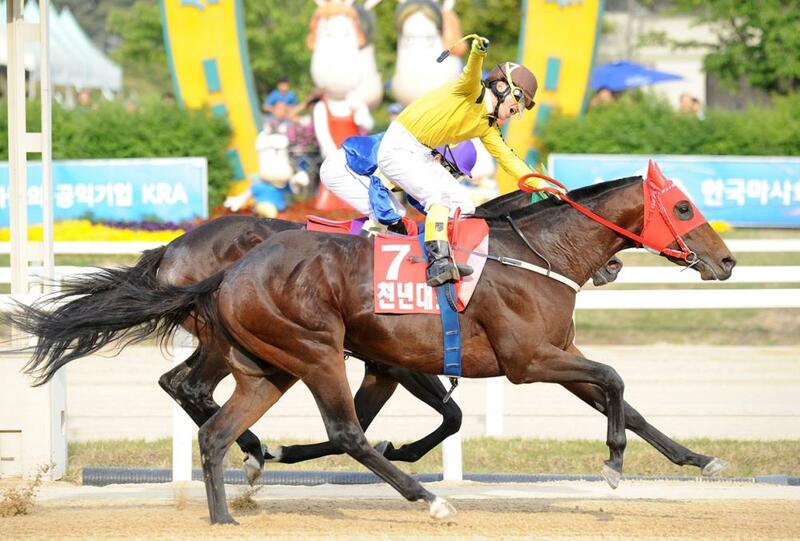 Cheonnyeon Daero – second in last year’s Busan Breeders’ Cup and third in this year’s KRA Cup Mile now heads this generation. This was only his third win but he had never been out of the money in ten previous starts. For both trainer Oh Moon Sik and jockey Park Geum Man the victory is by far the biggest in their careers. Can Northern Ace Stall Money Car’s Triple Crown? Derby day has dawned bright and sunny and racing is set to get underway at Seoul. At 5pm this afternoon, Money Car will attempt to land the second jewel of the Triple Crown as he goes in the 2010 Korean Derby. He’s going to need to run better and faster than he ever has before if he is to win. Facing him for the first time is the undefeated Northern Ace who has won all his four races by impressive margins without ever being asked for an effort. 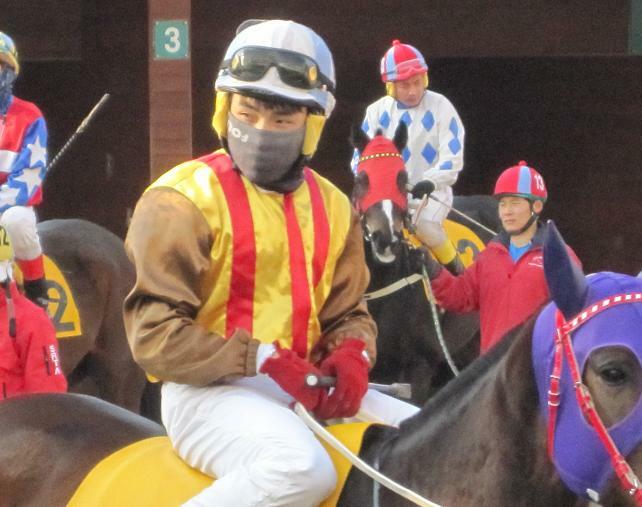 This duel is one of the most hotly anticipated in Korean racing for years. Also there will be Seonbongbulpae and although he will be less-fancied than the other two, he may play a big role in deciding the outcome. He will take on Money Car early and how the KRA Cup Mile winner responds to the unfamiliar challenge will be crucial. If he leaves his race on the first corner, Northern Ace could well be the beneficiary. Then there are the Busan horses. Four colts are seeking to make it three straight derbies for the south. Cheonnyeondaero is better than his Cup Mile performance suggests while Triple Sinhwa was relatively unknown before being the horse that got closest to Money Car a month ago. “Closest”, however, was still eleven lengths away. * Thanks to Fallight and Roar for the video uploads. The Derby is now less than two days away and it is, along with the Grand Prix, Korean racing’s biggest weekend of the year. See below for a full list of the Derby runners and riders and we’ll have a final preview on Saturday evening. Restricted to Korean bred fillies and mares at class three and below, the cream of Korean racing isn’t exactly on show here but it should be an entertaining contest nonetheless. A full field of fourteen is entered and Isanghwa is favoured to get the better of fellow four-year old Ruby. 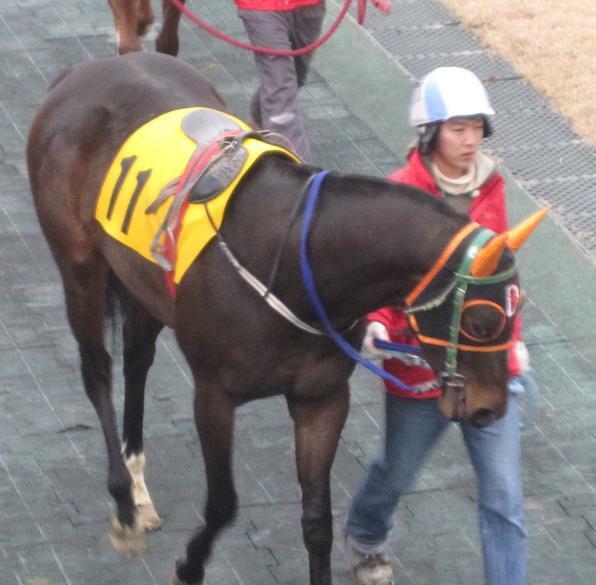 Beomtti, Victor Hunter, Sangju Miin and White Dreamer should also come into consideration. Still for Korean bred class three and below, its open to colts too and Mr. Calgary could get the weekend off to a great start for jockey Jo In Kwen who rides Seonbongbulpae in Sunday’s Derby. He’ll have plenty of competition in a very open race. Cheotinsang is in good form, as is the improving Saebyeogi. A good case could be made for three-quarters of the fourteen strong field. The Derby is a relatively recent addition to the Korean racing year. Except for an enforced stoppage during the Korean War, racing has been running on the peninsula continuously since the 1920’s, however, the calendar as we know it today only really started to take shape in the 1980’s. The Ilgan Sports Cup and the Grand Prix started things off with both being run for the first time in 1985. The introduction of the private ownership of race-horses – and therefore prize money – accelerated the creation of big Stakes races in the 1990s and finally in 1998, the Derby was run for the first time. 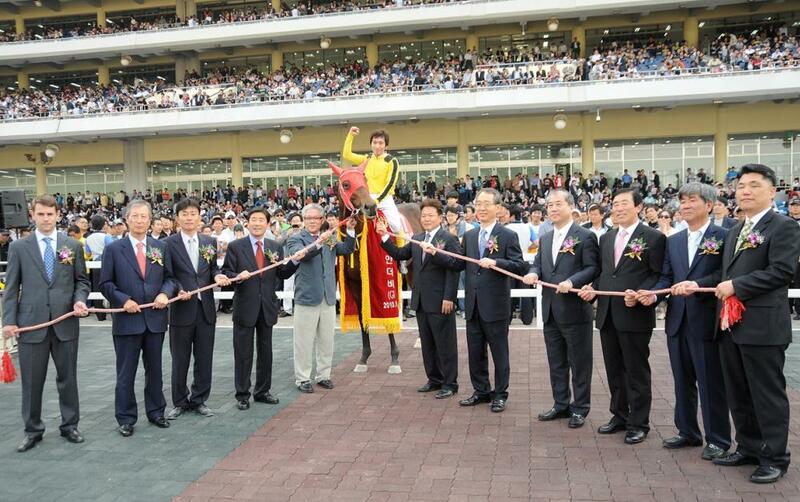 – The filly, a shock winner of the KRA Cup Mile a month earlier made it two in a row for Busan. She couldn’t maintain her form over the whole year, however, and went down to a shock defeat in the Oaks in August before returning for a creditable third in the Minister’s Cup, the third and final leg of the Triple Crown in October. 2008: Ebony Storm [Buster’s Daydream – Sorority Jazz (Dixieland Band)] – Shim Seung Tae – Two years ago was the first time that Busan’s best three year olds were invited up to Seoul to contest the Derby and it was one of those visitors, Ebony Storm, the longest shot on the board, who took victory in a monsoon downpour. 2007: J.S. 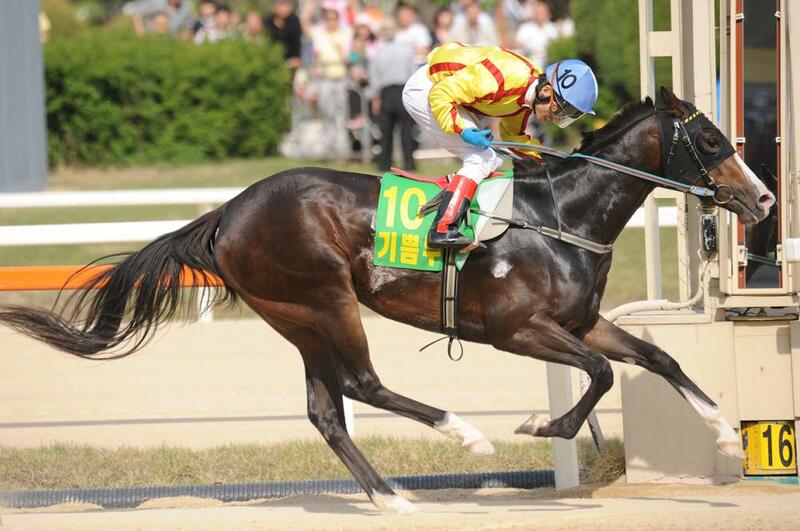 Hold [Ft. Stockton – Hwangsangjiljoo (Passetreul)] – Moon Jung Kyun – Widely considered the best Korean bred horse ever. J.S. Hold landed the inaugural Triple Crown injuring himself in the final race and not returning to the track. He is about to commence his first season of stud duties. 2005: Saebyeok Dongja [Fiercely – Cheongpa (The Rodgers Four)] – Chun Chang Ki – Raced on at the top level for three more years and his jockey Chun Chang Ki became a trainer after a battle against cancer. 2000: Haekdol’pung [Lost Mountain – Swift Diplomacy (Nice Pirate)] – Park Tae Jong – Korea’s most successful ever jockey got his second straight Derby win on the favourite. It was tight though, with Haekdol’pung getting the verdict in a three way photograph. * For more videos see Fallight’s YouTube page. This post is a slightly updated version of the one posted on the corresponding pre-Derby Monday last year. There will be four raiders from Busan and eight representing the home team at Seoul. With less than two weeks to go, twelve colts remain in contention for the 2010 Korean Derby which will be run at Seoul Race Park on Sunday May 16. Last year’s Champion two-year old, Seonbongbulpae will be there, the unbeaten Northern Ace will be there. But it is Money Car, winner of the KRA Cup Mile and on course for the Triple Crown, that they all have to beat. The Derby will cap a bumper weekend of racing. Just like last year, the KRA has designated it “International Weekend” and races sponsored by Horse Racing Ireland, the Australian Jockey Club and the Japan Racing Association will all be on the card. Money Car produced a sterling performance to leave the rest of the best of the nation’s three-year olds stalled in the Busan sand as he won the KRA Cup Mile, the first leg of the Korean Triple Crown at Busan Race Park this afternoon. Starting the odds-on favourite in a field which was reduced to thirteen following the scratching of Dae Wan (which is another story in itself), Park Tae Jong launched Money Car at full throttle out of the gate and into an early lead. No-one came to challenge him and he was able to cruise away from the field as they left the final corner and entered the home straight – eleven lengths the margin at the finish. 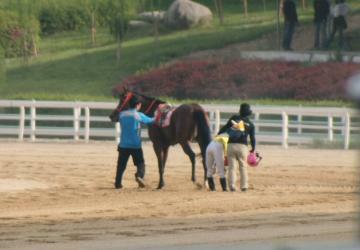 Triple Sinhwa led the field home as a distant second, just edging out second favourite Cheonnyeondaero. South African jockey Martin Wepner’s mount, Dangdae Bulpae, was sent off third in the betting but finished a disappointing eighth. Australian trainer Peter Wolsley saddled both Saeroun Taeyang and Mega Tough, who finished fifth and twelfth respectively. Money Car is one of the few foals to make the track by the young sire Newsprint, who died tragically young late in 2009. He’s now won six of his seven starts and although his main challenger for Triple Crown honours, Northern Ace, was absent today, Money Car is now in pole position for the Korean Derby which is just over a month away. Money Car’s victory was the first for a Seoul based horse in a Classic since the Triple Crown series was opened up to runners from both the nation’s thoroughbred tracks. The last horse from the Capital to win one was J.S Hold who would, of course, go on to sweep all three in 2007. Money Car wasn’t the only one of the ill-fated Newsprint’s progeny to score today. Up at Seoul Race Park, 2009 Champion Juvenile, Seonbongbulpae, was an emphatic winner in the class 2 race 9 and has qualified for the top-tier of racing. Could a showdown with Money Car in the Derby be the ultimate tribute to his sire? On any other afternoon, Seonbongbulpae would have been the star at Seoul, but today was not just another day. The main event in the capital was the coming of age of a different three-year old. Overseas-bred horses aren’t eligible for the Triple Crown but do make up the elite of those running on the peninsula. Tough Win [Yonaguska – Maggie May’s Sword (Sword Dance)] is one of the most exciting of those to arrive in Korea in recent times and went into today’s showdown with Bulpae Gisang – winner of last year’s Busan Metropolitan and recognised as the second best horse in Korea – with a perfect five from five record. He maintained it. Haengun Daewang, a winner last time out, set the early pace, but Tough Win took command as the field entered the home straight. Bulpae Gisang is a closer and under Choi Bum Hyun he did indeed make a late run. The younger horse always had things in hand though and, while he won’t have a four kilo weight advantage again, punters were already thinking this could be the horse who could take on Dongbanui Gangja later on this season. Any final clash would potentially be in the season ending Grand Prix. Today Money Car and Tough Win were both first to their respective “chequered flags”. Later this year we may find out who is the greatest “Prancing Horse”.